Ring in the New Year with the Cricut Cuttlebug machine now, $59.99. Valid thru 1/1/19. Some restrictions apply. Offer available Wednesday, December 26th 2018. Expires Wednesday, December 26th 2018. Happy New Year's savings from Ink4Less. 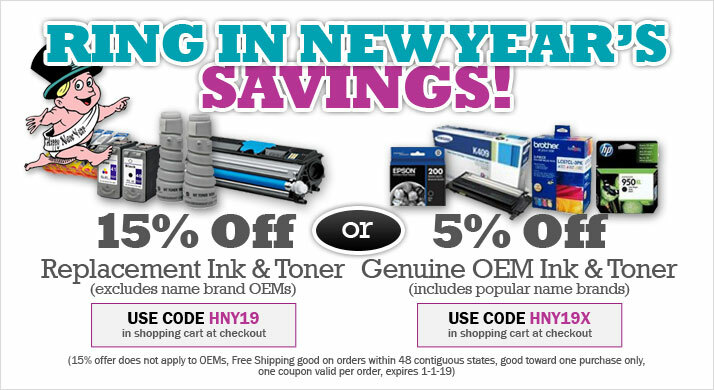 Shop Ink4Less.com through New Year's Day and save 5% on original name brand OEM ink and toner cartridges. Plus, all orders over $49 ship free. Some restrictions apply. Free Shipping good in 48 contiguous states, good towards one purchase only, cannot be combined with any other offer. US only, age 18+ Offer available Friday, December 21st 2018. Expires Friday, December 21st 2018. Ring in the New Year with great savings at Ink4Less. 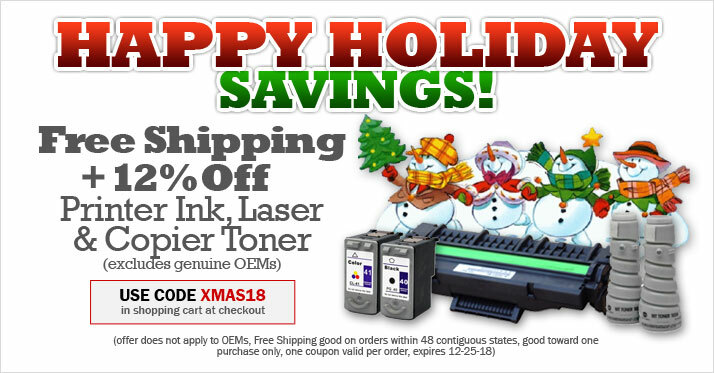 Shop Ink4Less through New Year's Day and get 15% off remanufactured or compatible ink and toner printer cartridges. Plus, all orders over $49 qualify for Free Shipping. Some restrictions apply. Discount does not apply to OEM products, Free Shipping good in 48 contiguous states, good towards one purchase only, cannot be combined with any other offer. Offer available Friday, December 21st 2018. Expires Friday, December 21st 2018. Get 4 Instagram Mini frames for $125, regularly $156, when you use code BYE2018 before the new year. Limit one code per order. Archive and American Hardwood Collection pricing varies. Some restrictions apply. Limit one code per order. Archive and American Hardwood Collection pricing varies. Offer available Wednesday, December 26th 2018. Expires Wednesday, December 26th 2018. Tags: Get 4 Instagram Mini frames for $125 regularly $156 when you use code BYE2018 before the new year. Limit one code per order. Archive and American Hardwood Collection pricing varies. Some restrictions apply. Offer available Thursday, December 20th 2018. Expires Thursday, December 20th 2018. Use Code: DESK2019. Quantity limit 1. Shipping and Handling Not Included. Ordered Online. 1 use. Cannot combine coupon codes. Offer open to new and existing customers. Expires 02-01-2019. Some restrictions apply. Quantity limit 1. Shipping and Handling Not Included. Ordered Online. 1 use. Cannot combine coupon codes. Expires 02-01-2019. Offer available Thursday, December 20th 2018. Expires Thursday, December 20th 2018. Some restrictions apply. Offer available Wednesday, December 19th 2018. Expires Wednesday, December 19th 2018. Some restrictions apply. Code not valid until start date Offer available Wednesday, December 19th 2018. Expires Wednesday, December 19th 2018. Some restrictions apply. Code not valid until start date Offer available Saturday, December 22nd 2018. Expires Saturday, December 22nd 2018. Some restrictions apply. Code not valid until start date Offer available Monday, December 24th 2018. Expires Monday, December 24th 2018. Some restrictions apply. Code not valid until start date Offer available Saturday, December 29th 2018. Expires Saturday, December 29th 2018. Celebrate holiday savings with Ink4Less. Get Free Shipping and save 12% on your remanufactured or compatible replacement ink and toner cartridge order (excludes OEMs). Some restrictions apply. Discount does not apply to OEM products, Free Shipping good in 48 contiguous states, good towards one purchase only, cannot be combined with any other offer. Offer available Friday, December 14th 2018. Expires Friday, December 14th 2018. Some restrictions apply. Offer available Monday, December 17th 2018. Expires Monday, December 17th 2018. Some restrictions apply. • Offers will work on base price only & not applicable on special sizes 5"x7", 7"x5" and 8"x8" of Canvas Prints, and Accessories. and Mn Order $49 Offer available Friday, December 14th 2018. Expires Friday, December 14th 2018. Some restrictions apply. Code not valid until start date Offer available Sunday, December 16th 2018. Expires Sunday, December 16th 2018. Some restrictions apply. Code not valid until start date Offer available Friday, December 14th 2018. Expires Friday, December 14th 2018. Some restrictions apply. Cannot be combined with general spend codes. Offer available Thursday, December 13th 2018. Expires Thursday, December 13th 2018.